New Kawasaki Ninja H2 has been launched in India at Rs 29 lakh (ex-showroom Delhi). The New Kawasaki Ninja H2 is a tamed version of the track only H2R motor bike. Ninja H2 comes in via the CBU route and for the Indian market, it is said that only 5 units have been allocated. Both the Ninja H2s were unveiled at the Intermot 2014 event. 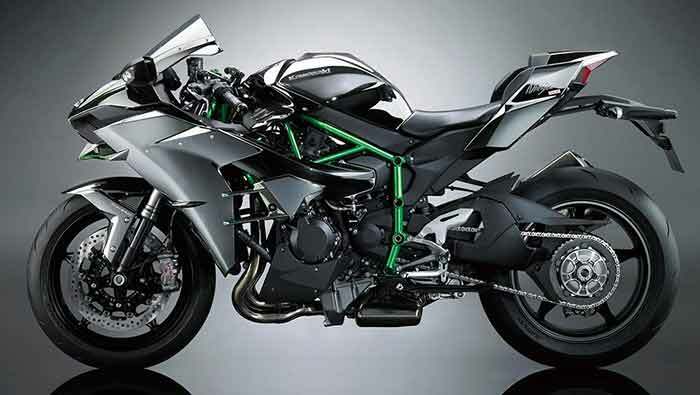 The fascinating thing about Kawasaki Ninja H2 is its massive 998 cc inline liquid cooled supercharged 4-cylinder engine. At 10,000 RPM, the super-cooled engine churns out upto 200 PS of power and at 500 RPM more, yields a maximum torque of 133.5 Nm. The 6-speed gearbox of Kawasaki Ninja H2 helps put all its power to the street. Kawasaki claims that it is most fastest motorcycle in India hitting 0-100kmph in mere 2.5 seconds. The chassis of the Kawasaki Ninja H2 is made of a high tensile steel trellis frame. 17-litre fuel tank of Kawasaki Ninja H2 sits atop the chassis while the motorcycle weighs 238kg.